Not a lovely photo, this week, but the prompt called for a picture of normal people doing something they normally do. In this case, I consider these extraordinary people, but they’re doing something they consider their calling, so it’s ordinary to them. The people in the photo are in the process of resetting a gravestone. The three in Park Service uniforms worked at Black Diamond Mines Regional Preserve in Antioch, California. They’d made it their mission to restore and reset all the gravestones in their tiny graveyard, all that remained of five coal-mining towns that used to stand where the park is now. The man in the blue t-shirt is Fred Oakley, a member of the Association for Gravestone Studies, who made it his life’s work to rescue old graveyards. I only had the opportunity to meet Fred this once, but I was impressed by the depth of his passion for his mission. Even the smallest moments can be amazing. 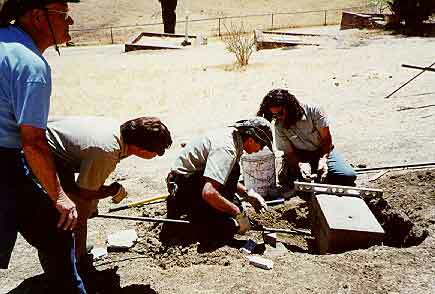 The rangers at Black Diamond are in the process of leveling a base stone in order to set a gravestone back in place. Almost all of the gravestones in the park had been shattered, since well-meaning historians in the 50s decided they would be safer lying flat on the ground — where they were subsequently stomped on. The rangers were carefully chipping the bits of stone from the ground, then setting them back together like huge, heavy puzzles. Their goal was to return all the stones to their upright positions. Basically, they were piecing history back together. They believed that was the only way to help people in the present connect with people in the past. This entry was posted in Photo Challenges and tagged Association for Gravestone Studies, California cemeteries, cemetery workers, photo of the week, postaday, postaweek2012, Rose Hill Cemetery. Bookmark the permalink.